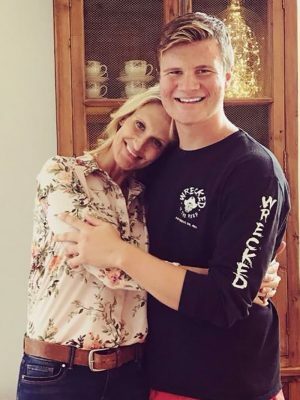 A degree from Northwestern, a career in Christian ministry for the disabled and 20 years as Austin Forney’s mother have given Melissa Pullon exceptional insight into her son’s autism spectrum disorder (ASD). 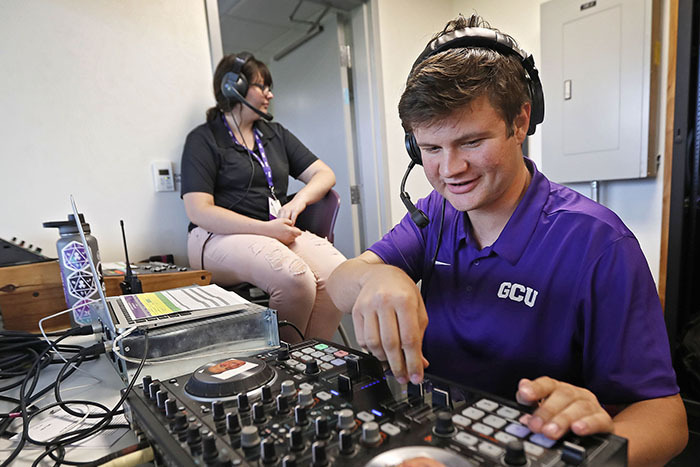 That’s why Grand Canyon University‘s Welcome Week in August 2016 was critical for the freshman from Scottsdale. Unfortunately, his freshman friends went their separate ways, leaving Forney isolated in the early months of his sophomore year. Melissa Pullon and her son, Austin Forney, in their Scottsdale home. At his lowest points, Forney retreated to his room, skipping meals, skipping class and procrastinating with assignments. A saving grace was his student worker job mixing music at The Gathering, the all-student worship service every Tuesday night. Worship manager Jared Ulrich mentored Forney’s efforts. Jared Ulrich is an “amazing, amazing Godly man,” according to his mentee, Austin Forney. 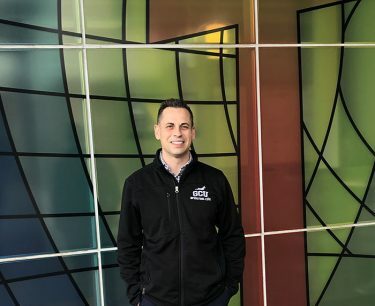 As Forney forged new friendships the past 10 months, his need for support in his residence hall has decreased, yet he’s keenly aware of the need for RA’s to step up for all students. A musical prodigy since pre-school – he played Mozart on the piano at age 4 – Forney has an exceptional ear for mixing sounds. Watching her son pump up the crowd at his new student worker job, mixing music at athletic events, is a surreal experience for Pullon, who was informed of her son’s brain abnormality before he was born. 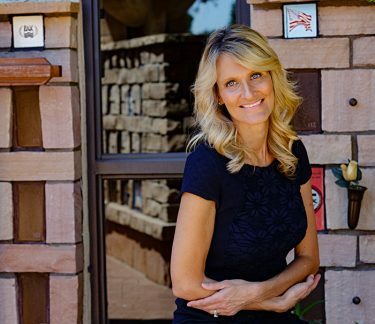 Melissa Pullon is the Director of Special Needs Ministry at Mountain View Presbyterian Church in Scottsdale. From birth, Forney was extremely sensitive. “It is so hard to watch it in your own child,’’ said Pullon, who became her son’s life preserver when he was bullied and his translator when people didn’t understand his behaviors. “She’s always been in my corner,’’ Forney said. Pullon had to learn how to deal with it as her son became fixated on Spider-Man, Buzz Lightyear, hieroglyphics and ancient Egypt for certain periods of time. “There was nothing that was going to get him off that topic,” she said. During the latter phase, Pullon buried artifacts in their backyard early each morning, so when Forney woke up he could begin an excavation. There was nothing simple about a trip to the park or the library. “It felt like I was always playing offense, researching every environment,’’ she said of pre-determining whether dogs would be present or crowds. Or, in the case of a haircut or doctor’s appointment, how long would they have to wait? 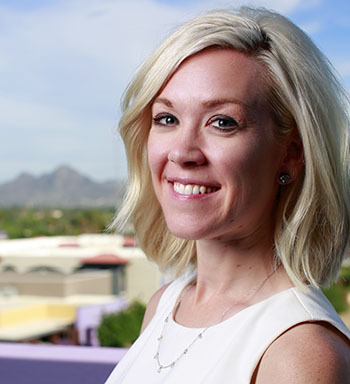 Understanding the triggers that affect some students identified with ASD and not others is part of the Master of Arts in ASD offered by GCU since 2015. Lindy Gaudiano, a program director in the College of Education (COE), organizes the 32-credit program, which has nearly 300 online students. “Our Student Success Counselors told us that students were inquiring about programs specializing in autism spectrum disorders because it is on the rise,’’ she said. Lindy Gaudiano manages the Master of Arts in ASD program. The program is limited to students who have obtained a bachelor’s degree or a master’s degree in Special Education and have worked with special education students. Field experience is required for the program, including observations and one-on-one interventions with students on the spectrum, collaboration with classroom teachers, and interviews with the parents of students with ASD. GCU’s clinical practice team sets up the master’s student with the students on the spectrum through their partnerships with schools nationwide if placement is necessary. 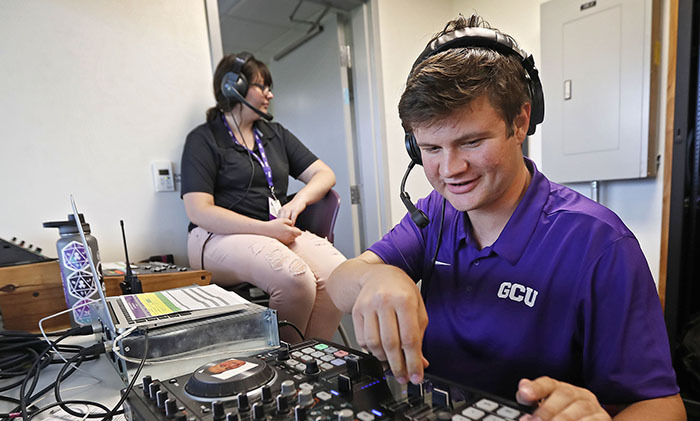 GCU students complete required practicum hours with students on the autism spectrum and work with a mentor throughout their program to verify all hours are completed. Dr. Rebekah Dyer, whose Ed.D in special needs includes a 214-page dissertation on students identified with ASD, is constantly adding to her knowledge base. Arizona is an apt place for her studies because parents of children with ASD have intentionally moved to the state, drawn by its numerous resources, including SARRC, the Southwest Autism Research and Resource Center in central Phoenix. SARRC is comprised of a school for exceptional children, a research center and a vocational and life studies academy. Increasingly recognized as an expert, Dyer spoke last fall at an international autism convention in China, and the results of her research will be added to the master’s in ASD curriculum when it is revised in June. Dr. Rebekah Dyer is conducting a study on children who are identified with autism spectrum disorder. In Dyer’s role as a COE associate professor, only one student has shared his ASD diagnosis with her. Through his willingness to share his condition, Dyer was able to ease his stress. 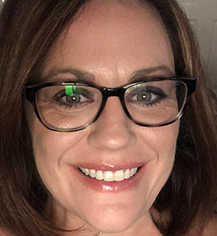 Dyer has collaborated with Beth Jamison and her Student Disabilities Services (SDS) staff on a mentoring program through the new ASD Connection program and consulted with Pullon, who views the caring educator as another link in a GCU fabric that has wrapped itself around students with ASD.